* Books can only be shipped to USA addresses. Shipping cost is $4.00 per order. Over the past 40 years, I have a developed a way of teaching that makes understanding and playing the 32 most popular chords at the piano surprisingly easy. (With 12 different keys, that’s 384 different chords!) Imagine being able to understand the chord symbols and play the rich harmonies used in today’s music! Pianists, Songwriters, and Accompanists: Imagine being able to understand the chord symbols and play rich harmonies used in today’s music! Piano and Voice Teachers: Imagine a simple yet comprehensive way to teach the world of modern harmony to your students. With this approach, you make each new chord by changing just one note of a chord you previously learned. You learn to play the chords with your right hand while playing bass tones with your left (for accompanying others) and also with your left hand (for solo playing). A new series about chords that starts at the very beginning and moves step by step into the art of arranging. For beginners or people new to arranging. Students who don’t yet read music can be guided through the book by the teacher. This book helps a person learn to play eight of the most popular melodies of all time and add simple bass lines. It prepares a person’s ears, hands, and mind to start the art of arranging using simple chords in Book 1. Learn about the most basic chords and how to make your own arrangements for solo piano. Learn to style colors, add color tones, and substitute minor chords for the usual major ones. Also learn about inverting chords and making arrangements in ragtime and boogie-woogie styles. These skills open the door to a wide range of useful and rewarding musical activities that can last a lifetime! Learn how to transform simple chords into full-sounding accompaniments. This means you will be able to play music with singers and others, and also play in bands of various kinds. In addition, you will be able to accompany yourself when you perform or write songs. With this purchase, you receive PDFs of Puzzle Play Prep, Puzzle Play 1-A, and Puzzle Play 1-B. Enjoy! Continue to explore making arrangements of popular tunes for solo piano. Learn to play much fuller-sounding left-hand accompaniments with the left hand, including “open voicing” and “jump basses.” Then, play both melodies and chord tones simultaneously with the right hand. The final section explores ways to play and style seventh chords: dominant 7th, minor 7th, and major 7th. Continue to explore how to make rich-sounding accompaniments at the piano. Learn to play baselines with the left hand, and how to style the chords played with the right hand in various ways. Learn about inversions, slash chords, seventh chords, and a few other chords such as suspended and altered chords. With this purchase you’ll receive PDFs of Puzzle Play 2-A and 2-B. Explore how to play the three main seventh chords in a wide variety of solo styles and learn new, intriguing arranging techniques. This book combines parts 1-A and 1-B in a single 122-page spiral-bound book. Part 1-A teaches how to make artistic solo arrangements using just simple chords. Part 1-B teaches how to make full-sounding accompaniments with these same chords. Learn skills to enjoy for a lifetime! This set includes Puzzle Play Prep, and Book 1. (Book 1 combines Puzzle Play 1-A and 1-B.) Each book is spiral bound for ease of use at the piano. Combines parts 2-A and 2-B in a single 124-page book. In 2-A, make arrangements of popular tunes for solo piano using fuller-sounding left-hand accompaniments and then play both melodies and chord tones simultaneously with your right hand. The final section explores various seventh chords. In 2-B, explore how to make rich-sounding accompaniments at the piano. Learn to play baselines with your left hand, and how to style the chords played with the right hand in various ways. Learn about inversions, slash chords, seventh chords, and a few other new chords. This set includes Puzzle Play Prep, Book 1, and Book 2. Each book is spiral-bound for ease of use at the piano. 88 unique variations on the most popular tune in the world! A New Age, Beethoven in F Major, Beethoven in F Minor, Birthday Hymn, Birthday Tango, Blue Birthday, Brubeck, Caribbean Birthday Dance, Chopin’s Birthday Nocturne, Early Debussy, Elton, Etude, Fats Domino, Finger Exercise, Flight of the Birthday Bee, Gershwin’s Rhapsody in Birthday, Gospel, Happy Bach Day, Happy Montuno to You, Heart and Soul Birthday, Here Comes the Birthday, and Hungarian Birthday Dance. In the Birthday Mood, It’s your Birthday Charlie Brown, Joplin’s Birthday Rag, Like Fine Wine, Many Miles, Minuscule Birthday Waltz, Mozart, One Year Closer to the Grave, Peanuts, Puccini, Ravel, Satie Birthday, Sousa’s Birthday March, Strauss’ Beautiful Birthday Waltz, Sugar Plum Birthday Fairy, The 50’s Rock, The Duke, The Years Fly By, Those Modern Jazz Harmonies, Twilight Years, Vivaldi, and We Wish You a Merry Birthday. Bebop Birthday, Birthday at Tiffany’s, Birthday Concerto, Birthday Liszt, Birthday Minuet, Birthday Shuffle, Birthday Waltz for Bill, Birthday on Route 66, Chico Birthday, Chopsticks Birthday, Chopsticks, Clocks Keep Ticking, Country Birthday, Der Geburtstag Overture, Have a Sweet Birthday, Heroic Birthday, Music of the Birthday Night, Pomp and Birthday, Silver Birthday, Take the B Train, Taking This Birthday in Stride, Texas Boogie Birthday, and Years Already Gone. Birthday After 2001, Birthday Clowns, Birthday Gumbo, Birthday Hoedown!, Birthday Power, Bossa Nova Birthday, Funky Birthday, Have a Wonderful Year, In the Composition Department, Jarret, Late Debussy, Left-Handed Compliment, Nostalgic Birthday Waltz, Persian Birthday, Prokofiev’s Birthday March, Quite a Feat!, Rachmaninoff, So Many Yesterdays, Time Goes By, Tyner, Verdi’s Grand Birthday March, You Haven’t Lost a Step! This PDF includes all 88 Birthday Variations mentioned above! The series on arranging published by the Royal Conservatory of Music. * Spontaneously create artistic arrangements of your favorite songs at the piano? * Instantly read fake books? * Play those rich 9th and 13th chords? * Create accompaniments for singers? * Play by ear? Have a repertoire of popular music to play at public events? * Be able to improvise on your arrangements? * Learn music theory (chords, keys, and scales) in a musical, enjoyable, and practical way? * Memorize your pieces more securely? You can learn to do all these things with the Chord Play series. 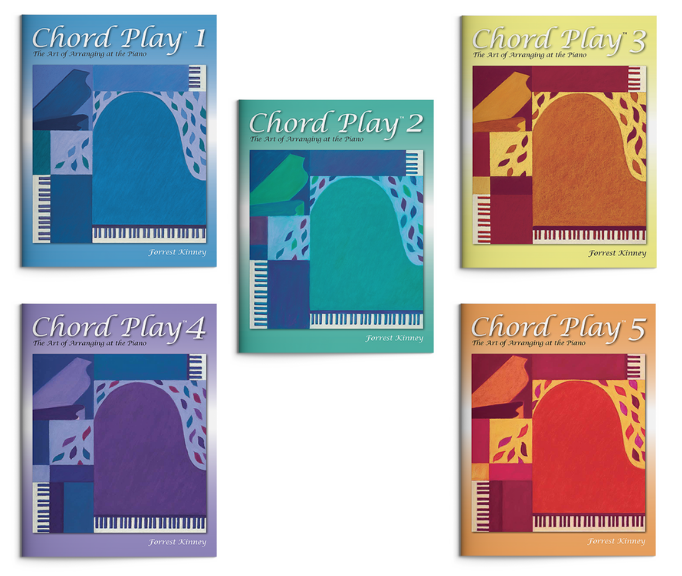 This series is designed to complement both traditional piano lessons and the Pattern Play books. How is this different from Puzzle Play? 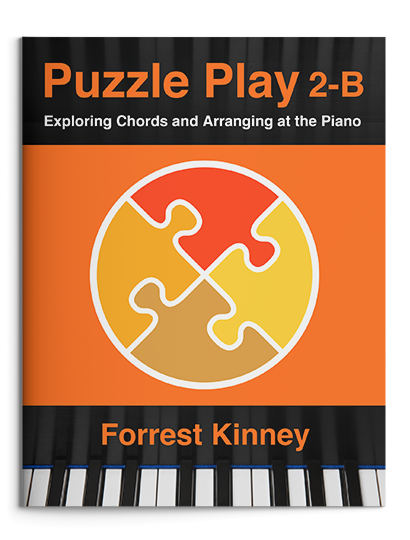 Chord Play is already a complete series (Puzzle Play will not be finished until 2020 or so), and it is sometimes better suited to people with some experience at the piano. On the other hand, Puzzle Play starts at the very beginning (learning tunes by ear), and moves more slowly to develop one’s ability to think as an arranger in a step-by-step fashion. These books are no longer sold on this website but are available at rcmusic.com (where you can get an excellent discount on the set), print-music stores, and online music stores.